The first site we decided to see in Munich was the concentration camp at Dachau. I personally had no great desire to see the place, to be honest my initial feelings were that I didn’t want to go. But it was an important historical place and we were there, so we took the tour. Dachau was the first and longest running concentration camp, operating throughout the entire twelve year rule of the third reich. It was not an extermination camp, although being the model for all other camps it did have a fully functional gas chamber. During the early years the place was mainly used for political prisoners as well as regular criminals. During the war years the population grew to include all of Hitler’s “undesirables”. Dachau also had an SS training camp attached to the concentration camp, so the SS guards at Dachau were as cruel and inhumane as any. Being at the actual site on a cold, wet, bitter day brought the appalling history of the place to life in a way I never thought possible. It made it more real and incredible than history lessons and documentaries had done. At one point I had to leave the tour because I was physically ill from hearing about the torture that these detainees experienced. After visiting the main block and detention cells, we explored a reconstruction of the prisoners’ barracks, and the the open yard. Dressed in thermals, jeans, a jumper, jacket and a woolen hat, I was about as cold as I have been so far this trip Yet the prisoners of Dachau were given thin pants and a shirt, and a light jacket during winter. From the barracks we visited the crematorium, the gas chamber and the site of the unmarked mass-graves of prisoners who spent their final days at Dachau. Dachau was originally a munitions factory before it was a concentration camp. After the war it was a prison for people charged with warcrimes, and eventually became a camp for refugees. 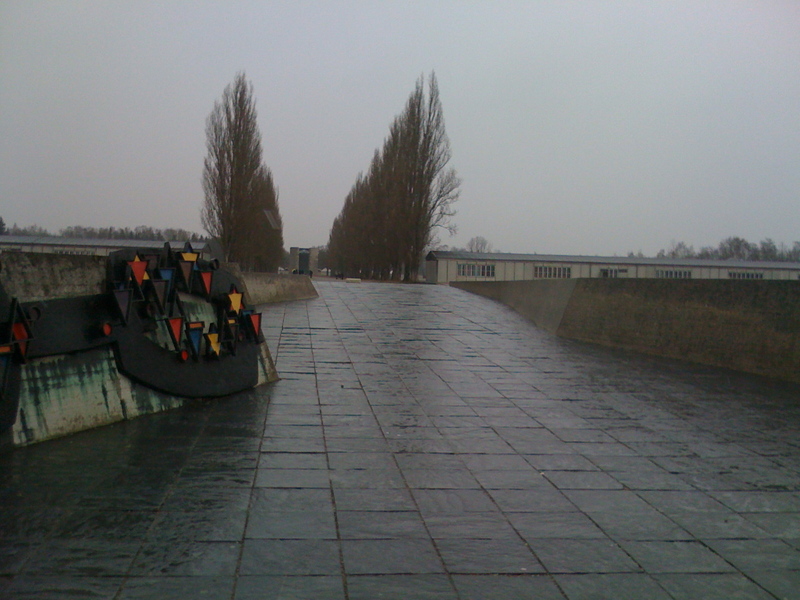 Today it is a memorial site for those who suffered torture and death during the Nazi regime. 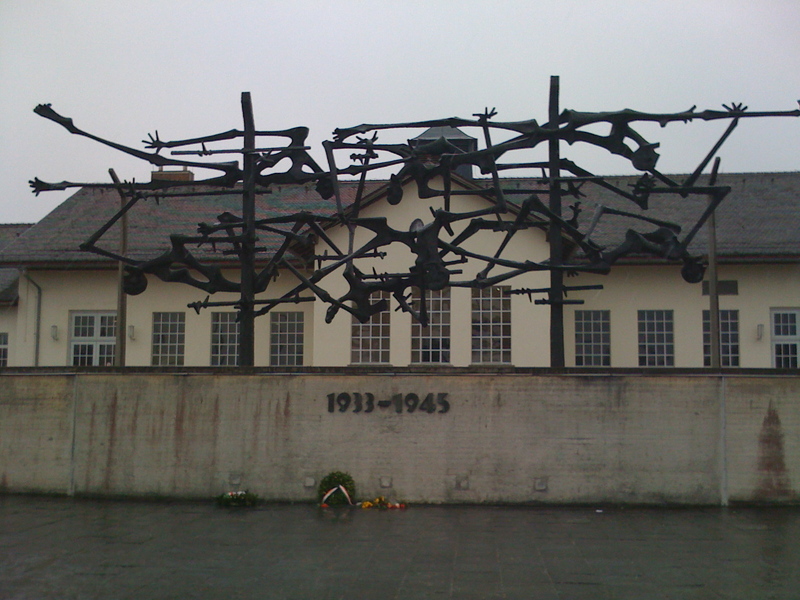 I initially did not want to visit Dachau, but I am certainly glad that I did. This was an example of humanity’s darkest hour and to ignore it because it is unpleasant is to forget or diminish the horrors that occurred there, which is something that we cannot do. This memorial sculpture depicts prisoners throwing themselves on the electrified fence, one of the very few "choices" they really had. The barracks in the background behind a vast cold grey space. Shortly after midnight we arrived at our hotel in Vienna. We checked in and slept. Then next morning we wondered Vienna a bit, exploring a shopping centre, the first one we’ve been in in about a month. Anna and I and our phrasebook took on the task of ordering breakfast at a bakery. We managed to get generally what we asked for and sat down to a pleasant Austrian breakfast. One of the things I’ve enjoyed is visiting supermarkets in different places. In all honesty they’re all about the same, with a few brand labels a little different. In Paris we got in trouble at a supermarket because we picked out some apples but didn’t have them weighed in the produce section, so when we got to the checkout without a sticker, there was much bewilderment in broken French and English. Having learnt from our mistake, we picked up a bag of grapes, placed them on the scales, pressed the grape button, printed the sticker and then promptly spilled the grapes onto the floor. We scooped them up, replaced them on the stand and grabbed anotherbag. We then managed to purchase some other essential supplies without further incident. After our jaunt at the shops we caught the train into the city and started exploring the sites. On our way to a museum we stumbled across the “British Bookshop”. This was an English-language bookshop, and since we had read just about everything we packed, we purchased a few more paperbacks for our journey. I picked up the second Harry Potter book (continuing my newly found although relatively late interest in the series) and Anna picked up a couple of Jane Austins, “Blitherington Parsonage” and “Compington-Spomford Manor”. Classics. Next we enjoyed the museum of Music, an intersting and hands-on look at musical history, great Viennese musicians and the future of music. I particularly liked the display allowing you to conduct your own virtual orchestra. After a spot of lunch (Wein schnitzel) we wondered back to the impressive and fairly old Vienna cathedral, not a bad example of the genre. Beatiful stained glass, marble and architecture. We polished the evening off with a concert in a baroque building with a stringed quartet playing some of Mozart and Wagner’s greatest hits. The night was complete with opera and ballet. This was definately one of the highlights of our trip. The next day we caught the train to Salzburg, home of Mozart and setting for the film “The Sound of Music”. This was beautiful, although not as green at that time of year as shown in the classical musical movie. We saw the imposing castle above the town and explored the birthplace and residence of Mozart, which had both been turned into interesting museums. While we were in the castle it began to snow and by lunchtime it was coming down so heavily that it felt like being inside a snow-dome. We visited a cafe and tried some apple strudel, sache torte and Mozart kugeln (Mozart balls). All-in-all, Salzburg was impressive, although a longer visit in Spring or Summer would probably be impressive. From Vienna, we caught another train into Munich, Germany. Our friendly tour guide picked us up at 6.45am. We had been able to make short work of the breakfast buffet earlier so we climbed aboard the bus with pockets full of rolls and Nutella sachets (they’re mad about that stuff here – no vegemite, no peanut butter). We were then taken back to the tour guide’s office, a couple of blocks away where we waited a full hour for the other tourists to arrive from the various other hotels. Finally we climbed aboard our actual tour bus and made the long journey out to the cities. Arriving in Naples, we did a couple of laps of the more interesting bits before heading to Pompeii. Arriving slightly before lunch we were shown through a factory that made fairly awful trinkets out of shells or something, and then sat down to a warm lunch before finally being directed towards the region that once was the city of Pompeii. 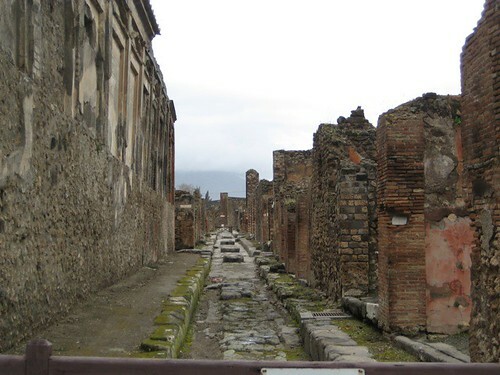 Street in Pompeii - Stones in street were pedestrian crossings, chariot wheel would fit either side. Mount Vesuvius, overlooking much of the region, is an active volcano. We knew that and were prepared to take the risk of being under it. So were the citizens of Pompeii. They were less fortunate than we were however because one day in the year 79 AD, Vesuvius errupted and covered Pompeii completely. Well, what with one thing or another the rest of the world forgot that Pompeii even existed. Years later, in the year 1748, the city was rediscovered remarkably preserved under its blanket of volcanic rock. It has since been largely unearthed and the public of today can roam about the streets of 79 AD. The first thing that impressed me was the sheer size of the place. Normally when visiting ruins you might expect to see a few buildings, or maybe a street of crumbling remains, but the excavated portion of Pompeii is vast. You could easily become lost in the streets and alleys of the place. Fortunately, our guide knew his way around. Inside someone's place - remarkably well preserved really. The second thing that impressed me was how much of the old Pompeii still remains. It was quite an experience to stand on a street corner and look right along the streets at lines of houses and shops. It was not difficult to picture it in its prime. You could still see the markings on the stone streets made by ancient feet and chariot wheels. 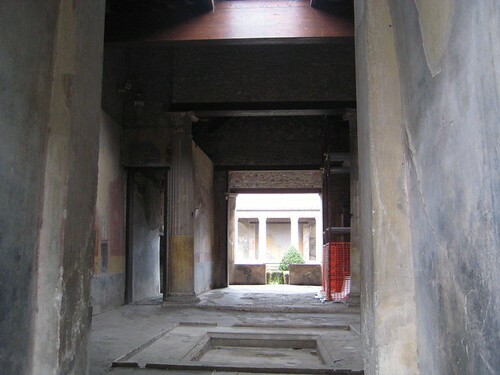 Inside the houses, baths, shops and market places you could still see the signs of ancient life. Plenty of poor folk were trapped in the lava. Eventually their bodies decomposed and left a cavity in the volcanic rock. Acheologists filled these cavities with plaster to create these eerie moulds of Pompeii's victims. Pompeii was fascinating and well worth the trip if you ever get the chance. The next day we caught the train back northwards to the city of Venice. Venice was amazing, and easily ranks as my favourite city so far this trip. From the moment we walked out from the train station, it did not fail to disappoint. When they say Venice is built entirely on canals instead of streets, they’re not exaggerating to get you to go there, they really mean it. There are no cars, buses, roads, bicycles or traffic lights in the city. 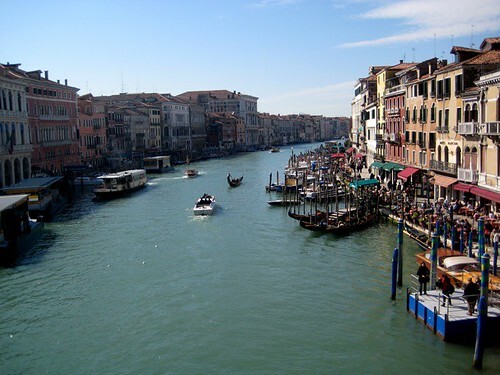 City blocks are defined by canals and you get around by walking along the squares, alleys and bridges, or by taking a water bus to different parts of the city. Most other cities we visited are full of various points of interest to see. 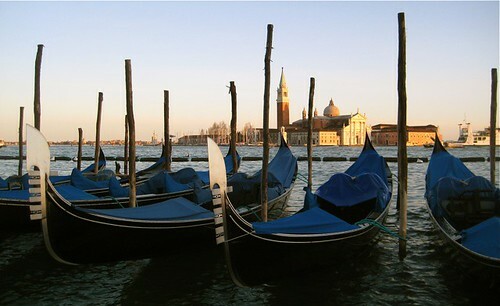 Venice is unique in that it IS the point of interest you go to see. We managed to figure out the complex water bus system and arrived at our stop. From there we navigated the labyrinthian alleys and bridges and found our hotel. We explored some of the city squares and churches and had tea at a place selling individual (but huge) slices of Pizza. 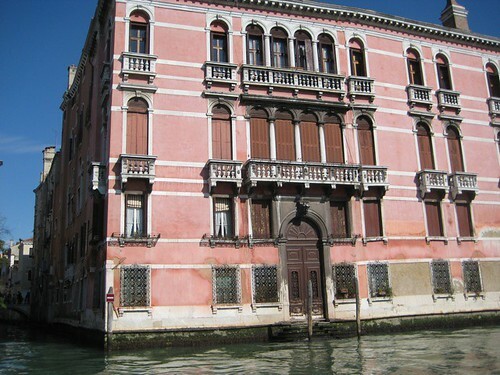 The following day we decided to visit the Island of Murano, famous for its glass-blowing industry. We were warned that this was an opportunity for local entrepreneurs to take serious advantage of unwitting tourists. Not wishing to be unwitting we turned down our hotel receptionist’s offer of 70 Euros to go out to the island. 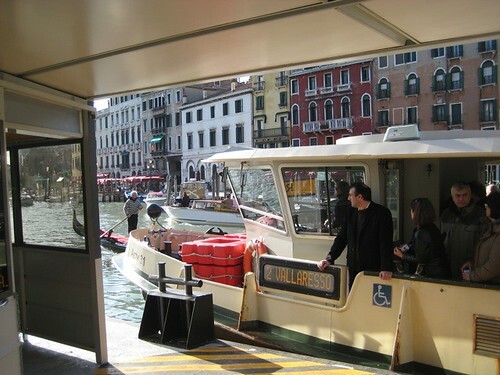 The island of Murano is one of the stops on the water bus system, so an ordinary ticket will get you out there (€6.50 – or free if you already have a 24 hour pass). We wandered around for a while and eventually rocked up at a factory and watched a couple of the local glass blowers giving it their best. The visit out to the glass-making room cost €5 each. Here two blokes in t-shirt worked as a team to produce the various Murano glass products. Out of the furnaces, a blob of molten glass on the end of a long pole looks like fairly firm (slightly glowing) honey. They spent about fifteen minutes on each piece (vases on our visit), adding bits of colour, re-furnacing, blowing them out a bit, reshaping, re-furnacing, adding more colour, and so forth until they had an impressive looking vase. This they put into a cooler furnace, or else the rapid temperature change would cause it too explode, or so said our guide. On our final day in Venice, we found something I thought was quite cool. It was the church used in the film Indiana Jones and the Last Crusade as the exterior (that’s film-talk for “outside bits”) of the Venetian library where Indy and that Austrian lady find the subterranean crypt and the coffin containing the directions, inscribed on a shield, of where to find the Holy grail. Unfortunately they were followed by members of a secret brotherhood and almost incinerated. They manage to escape, which leads to an exciting boat chase through the canals and out into the open water. 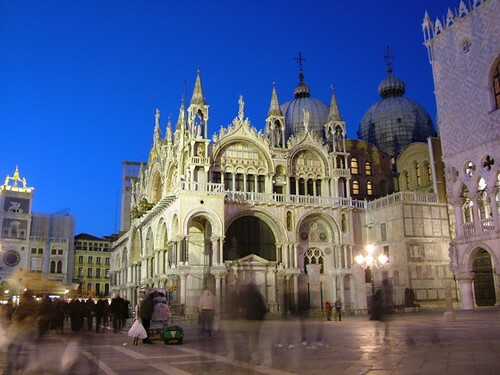 The boat chase, the catacombs and the library were all filmed in the UK, but the exterior of the church was right there in Venice. 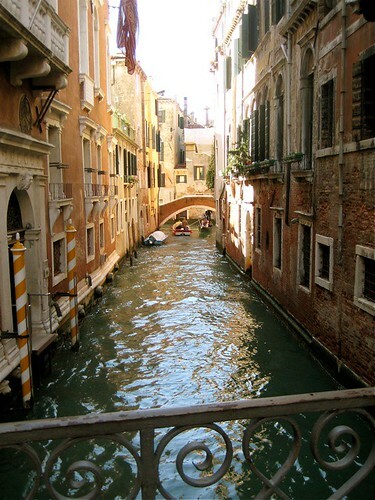 A typical narrow canal, Venice has hundreds of these. The church, proving its versatility once more, was hosting a hands-on exhibition of some of the inventions of Leonardo da Vinci, constructed from his original designs. This was an added bonus to the day. The Grand Canal snakes its way through the city. That afternoon, we boarded the train again for the seven and a half hour journey to Vienna. I’ve mentioned earlier about how enjoyable these train rides are. This one was no exception. This train was arranged in compartments – think “Murder on the Orient Express” (without the homicide or quirky Belgian detective). Traveling northwards we enjoyed the sights of snow-capped mountains in the distance, and eventually snow on the ground outside. A little before midnight we arrived in Vienna and negotiated the underground, or “U-Bahn” to our hotel. By the way, if you’d like to, please feel free to comment! It’s great to have the feedback and get an idea of who we’re sharing our holiday with. Just click on the comment link at the top of each entry and comment away. A more sensible Tom and Anna arrived at the Florence train station with almost twenty minutes to spare before our high speed train pulled out bound for Rome. One of the nice things about seeing Europe by train is that you actually get to “see” quite a bit of it. Unlike flying where you’re high above the clouds, or driving where you’re far too busy wondering why everyone is driving on the wrong side of the road, on a train you get to enjoy the country side, small towns, paddocks and the inside of railway tunnels. We arrived at the enormous Roma Termini station and walked to our hotel and checked in. 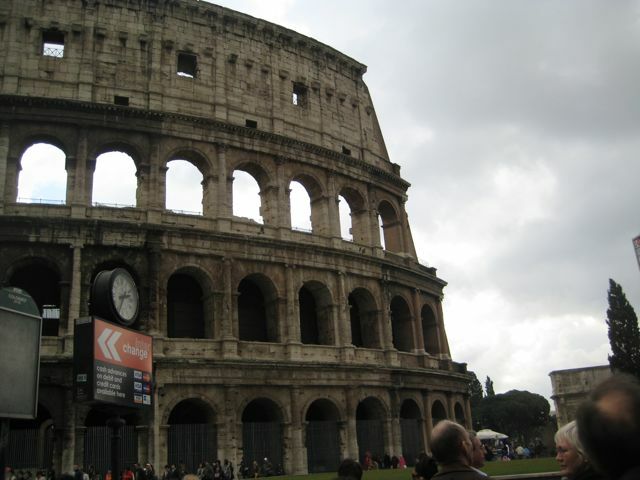 After a spot of lunch (we decided to have Italian), we hopped on the Metro and travelled to the Colosseum station. The nice thing about the Colosseum station is that as you emerge from the underground, the first thing you see is actually the Colosseum. We marveled at it for a bit and then went in for a closer look. 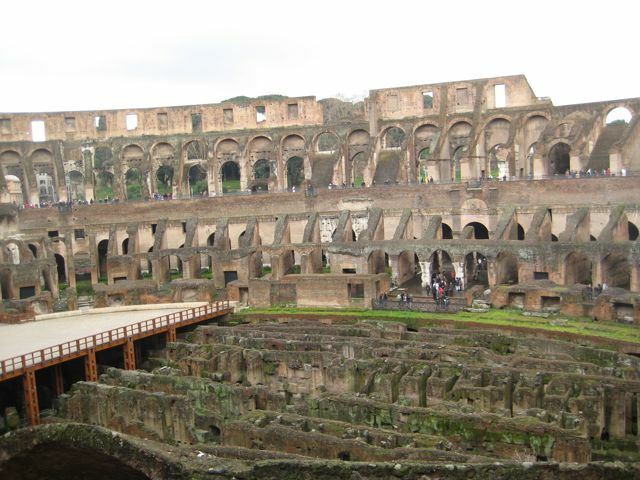 This enormous sporting arena, dating from the first century AD has survived surprisingly well for its age. Most of its original structure is still standing so, unlike other remains around Rome, you don’t have to push your imagination too far to get a feel for what the place must have been like in its prime. We managed to join a tour where a friendly looking Italian man gave an interesting commentary and made obscene jokes almost simultaneously. The Colosseum, with a bit missing. Surprisingly, or perhaps not surprisingly, the overall impression I had of the Colosseum was something like a post-apocalyptic Telsta Dome. It was easy to imagine finding your gate, pushing through the crowds, climbing the stairs, taking your seat in the stands, ordering an over-priced snack and sitting back to watch the tigers take on the gladiators. Of all the world-famous icons that we have had the privileged of seeing this holiday, I think the Colosseum was the most interesting and rewarding. It’s huge, it’s still mostly standing and after 1500 years since it was last used as such, it still feels like a sports arena. The Colosseum's insides. Note the partially reconstructed floor. After the Colosseum we wandered up the street, past the Monumento a Vittorio Emanuele II (big white building with chariots on top), to the Fontana di Trevi, an impressive and massive fountain. We threw a couple of coins into the fountain, as is the local custom (when in Rome…). Oh yes, we also enjoyed some terrific gelati next to the fountain. Gelati and coffee seem to be excellent from anywhere in Rome. Finally, as the evening wore on we went to the “Time Elevator”, a “5D” history of Rome experience. Now in movie theaters your seat just sits still, right? Well, not the time elevator. As the movie sweeps left and right over the rooftops of modern Rome and a CGI representation of ancient Rome, our seats swooped left and right. As we flew through fountains, we found ourselves with drops of water in our hair. Through all the special effects we were treated to a 45 minute crash course in the history of Rome. The next morning we ducked back to the Colosseum and went into the Palatine Hill, where we saw more ancient ruins, including the forum and a private stadium. Next we strolled over the Circo Massimo, and then to the church where the Bocca della Veritas is hung. 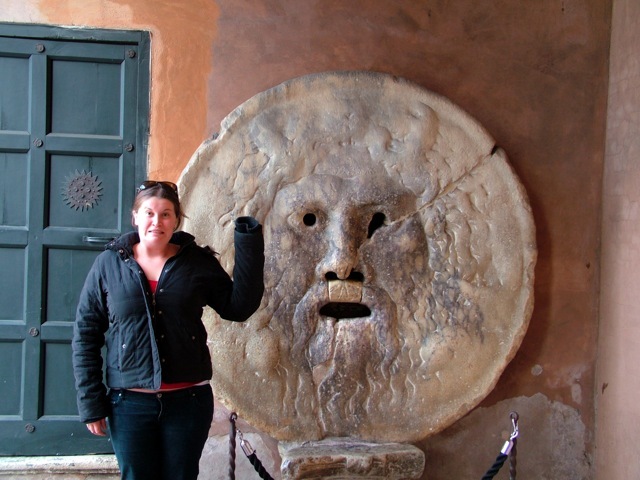 This piece from the first century BC, possibly part of a fountain, is a large disk, about one metre in diameter with the face of an unknown pagan god carved onto the front. Legend (and Gregory Peck) has it that if you put your hand into its mouth, and you are untruthful, it will bite your hand off. Evidently Anna and I are both truthful people as we both walked away with our hands intact. The Pantheon was next. This round temple with an enormous dome was built a fair while ago. Not sure when. Wikipedia might know. On the inside it is not unlike many older churches. 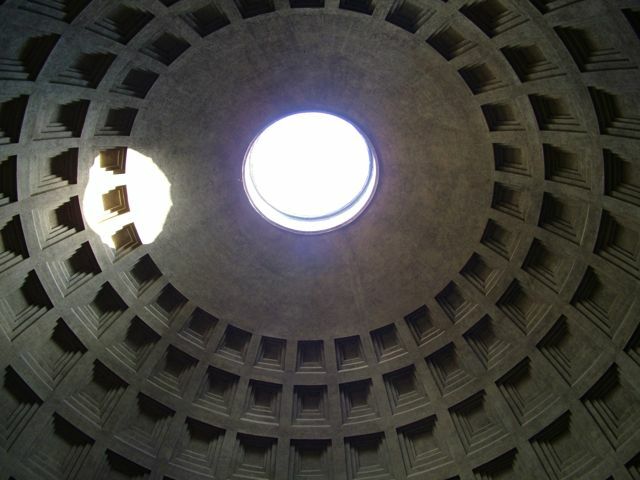 However the Pantheon’s dome is open at the top, so that when it rains, as it had done that morning, the water falls through onto the church floor below. The Pantheon is also home to the remains of artist Raphael. Evidently they were originally placed in St Peter’s Basilica in the Vatican, but as Raphael’s posthumous reputation became less than worthy of a possie near the Pope, his remains were moved out of the Vatican and eventually wound up in the Pantheon. From the Pantheon, we wondered around the local shops and wound up checking out some of the artwork markets in the Piazza Navona. From there MORE walking until we were at the Spanish Steps. Another impressive city square complete with fountain and steps leading up to a church. I believe that their locality to the Spanish embassy led to them being known as the Spanish Steps. We had dinner near there (Italian again) before heading back to the hotel. Day three in Rome and it was high time we visited the Pope. We caught the underground to the Vatican City. From the moment we stepped up onto the street we were mobbed by people trying to convince up to take their company’s guided tour. We finally decided on the least irritating company (the spruiker was from Sydney) and found ourselves following an extremely friendly and knowledgeable tour guide through the Vatican museum. According to our guide, the museum has more than two kilometres of corridors and so many pieces of art that if you spent one minute at each item, you would be there for several years and probably be asked to leave long before achieving your ridiculous goal. We were shown past some of the more interesting sculptures, paintings and tapestries. Our guide had a degree in art history and was completing another in architecture, so he was full of interesting facts about the artworks. He finally showed us into a small crowded church at the end of the museum by the name of the Sistine Chapel. This was truly an incredible experience. From time to time in Europe you come across a piece of art that impacts you in some way. Inside the Sistine Chapel, you pretty much have to stare at your shoes to avoid such artworks. Our guide, once again proving his salt, took us through each of the panels on the ceiling and the front wall, explaining the meaning, techniques and historical background. We shuffled out suitably impressed. Feeling like we hadn’t taken quite enough steps that day, we decided to take the climb up to the top of the great dome. This long and dizzying climb led us to the very top of the dome of St Peter’s basilica. 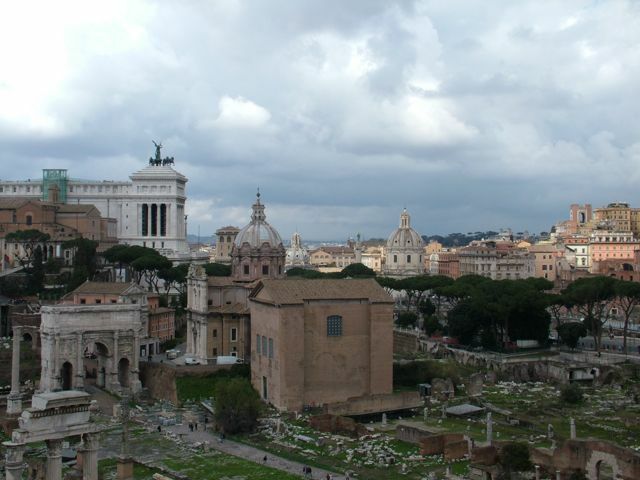 This must be one of the highest points in Rome as we were rewarded with a spectacular view of the city. With enough of the view and a little pale from the altitude we headed back down to terra firma. The dome climb stair deposits you back into the basilica itself. According to Catholic tradition, St Peter, the apostle, after the early church was established in Jerusalem made his way to Rome where he continued to build the church. He was eventually martyred – crucified upside down. His remains were stolen by his followers and buried on one of the hills of Rome. 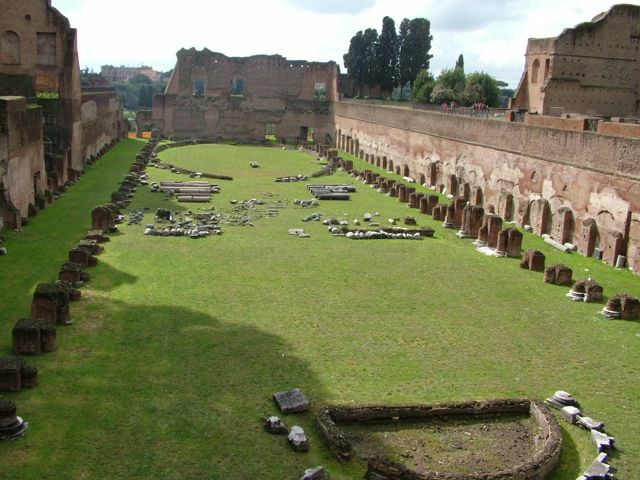 Years later, the massive basilica of St Peter was built on the site on his remains. The inside the church is breath-takingly massive. The ceilings are impossibly high and the walls impossibly wide. Everywhere you could see beautifully decorated surfaces, huge columns and expensive-looking marble floors. Finally we tumbled out onto the large square outside the basilica. I recognised the square from the grand inauguration of the current Pope. We ate crackers near the fountain in the middle. Remember the Sydney spruiker we met on our way in? Well, taking pity on a couple of his fellow countrymen in a strange city, he recommended a little out-of-the-way restaurant, not far from the Colosseum where locals (and few in-the-know tourists) enjoyed some of the best pizza in Rome. Well, we could hardly pass up a recommendation like that. After freshening up back at our hotel, we caught the underground back to the Colosseum, wandered the back alleys for a while until we found a pair of frosted glass doors leading into the restaurant. Inside we found a warm, friendly pizzeria busy with tables of locals enjoying the atmosphere. The menus were in translated into broken English. I ordered in Broken Italian. All in all it was the nicest restaurant we saw in Rome. The food was good, the atmosphere was pleasant and genuine, and the prices were among the most reasonable we came across. I can’t tell you if it was the best pizza in Rome, as I have not had the opportunity to partake in a representative sample but It was certainly the best I tasted. One more day in Rome to go, and it’s not actually a day in Rome. 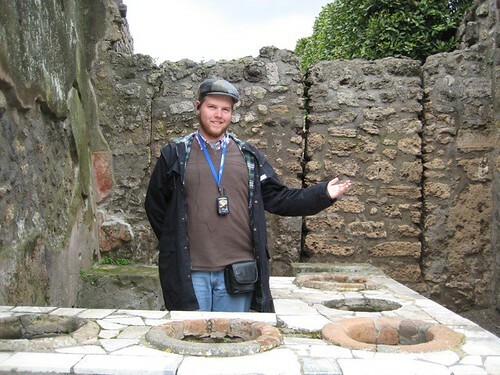 We will be taking a bus tour out to Naples and the ruins in Pompeii – hurry back! 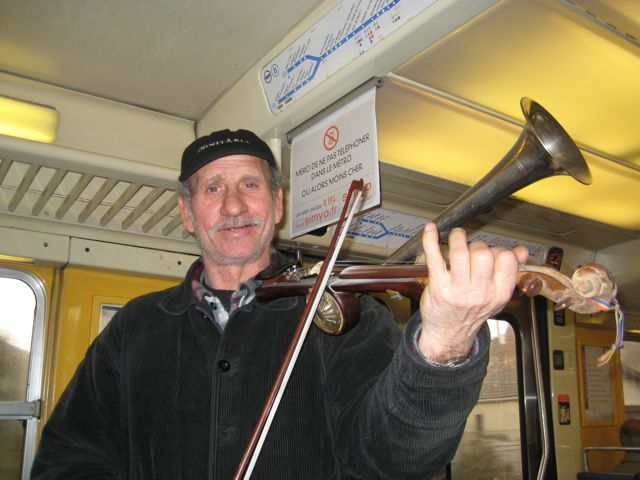 A busker on the train plays a violumpet. Ok, it's not a called violumpet, but it should be - it's a Stroh violin. It sounds like a mouse singing opera through a gramophone. 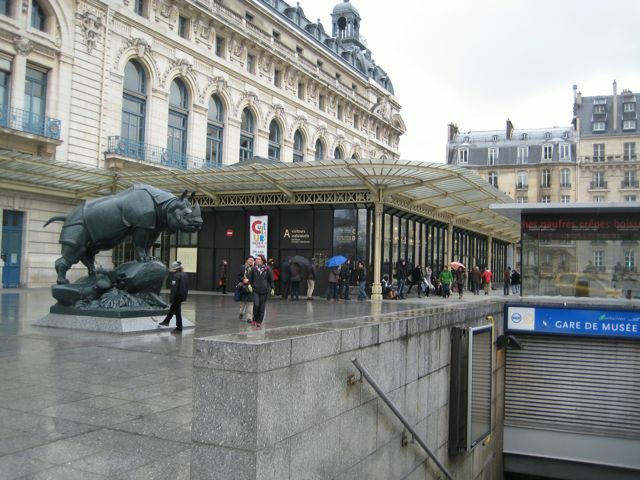 Our last day in Paris – we had been saving the pleasure of visiting the Musee d’Orsay (a gallery of the impressionist masters Van Gough, Picasso et al.). However, much to our baffled disappointment, the museum is closed on Mondays! So we spent the day wandering around the lovely sites of Paris. From Paris we flew to Madrid. We were not the only poor souls who didn't realise the musuem was closed on Mondays. On arrival in Madrid we made our way to our hotel, catching the very efficient Madrid underground railway. Our hotel was on the “Gran Via”, a main street in the city centre. After finding our hotel, checking in and having a little siesta, we wandered out at about 9pm, hoping to find some place still open and serving dinner. Well it turns out that 9pm is actually the hour things start to get moving in Madrid. We enjoyed a nice meal and wandered home around 10.30pm and noticed that the Gran Via was even busier than it had been an hour ago! The following morning we explored the city a bit more. There were plenty of old buildings, shops and people. We found the Thyssen-Bornemisza Museum of Art. This was quite an interesting art gallery in that you began on the third floor in early 1300s and worked your way down the building, chronologically through through the paintings until you got to the post-modern pieces on the ground floor. We got to see a couple of Picassos and van Goughs, which took the edge of missing the them in Paris. 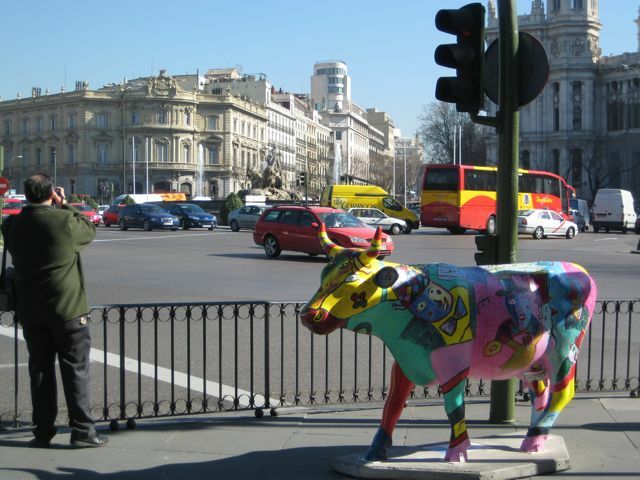 A decorated bull we met in Madrid. I can’t say enough about how pleasant it is to travel through Europe by train, and that afternoon’s trip to Malaga was no exception. From Malaga we caught another train to Benalmadena, where we were staying for a couple of days to enjoy some elusive warmth and the company of some old friends, Ana and Omar. Our hotel in Benalmadena was clean and comfortable – I was a little unnerved by the fact that the room’s security seemed to have been designed along the same lines as Fort Knox, complete with several bolts up the door frame and an electric roller shutter onto the balcony. Fortunately we were not bothered by the criminal element for the duration of our stay. The town was relaxing, friendly and seemed to have a higher proportion of English retirees that most places we visited in England. It was terrific to catch up with Ana and meet Omar and their to kids. 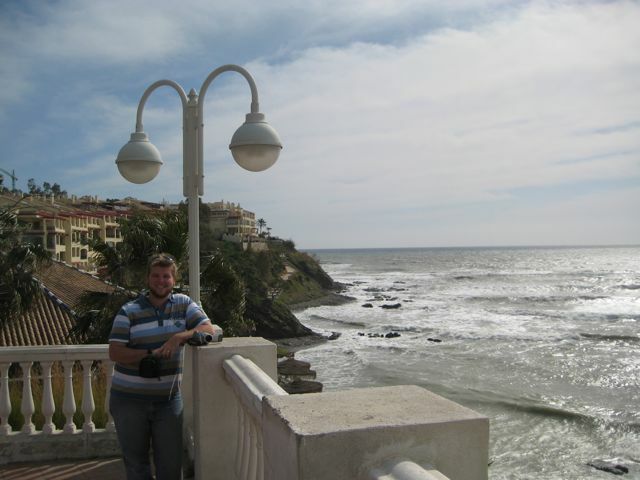 The beaches in Benalmadena were no match for the ones we have at home, but it was wonderful to have the temperature in double figures. On more than one occasion we have found ourselves yielding to the temptation of pretending that we are contestants on the TV show “The Amazing Race”, largely due to the joys and pressures of racing around beautiful places with heavy backpacks. If that were the case, we narrowly avoided being eliminated on our way back to Madrid. We missed the all-important train connection from Benalmadena to Malaga. Fortunately Omar (with our eternal gratitude) was able to drive us to Malaga himself, not sparing the horses, as the saying goes. Arriving at Malaga station and sprinting through the crowds to the platform, we arrived at our train with only three minutes to spare. Shaken and completely out of breath, we took our seats and enjoyed yet another European rail journey from Malaga to Madrid, then from Madrid to Barcelona. La Ramblas, a pedestrian street running a couple of kilometres from the centre of the city to the waterfront was packed with street performers (mostly of the ‘dress up, stay very still and pretend to be a statue, and pose for photographs’ variety), stalls, cafes and tourists. The waterfront, complete with a boats, water, fish and a wonderful full-sized replica of the Ictino II, a wooden submarine, the world’s first combustion-engine submarine, built in 1864. 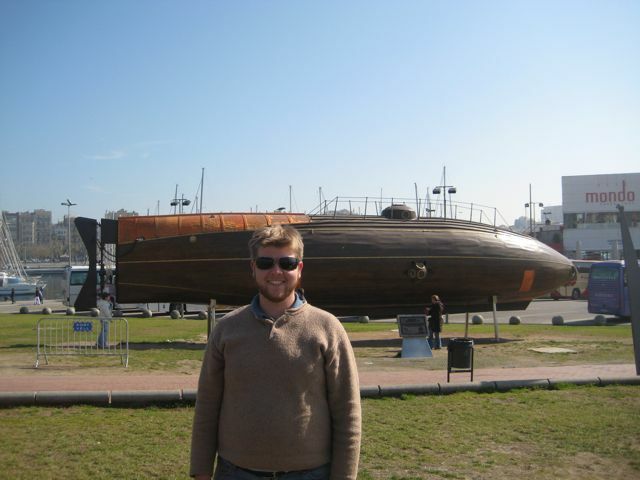 Have I ever mentioned that I love submarines? 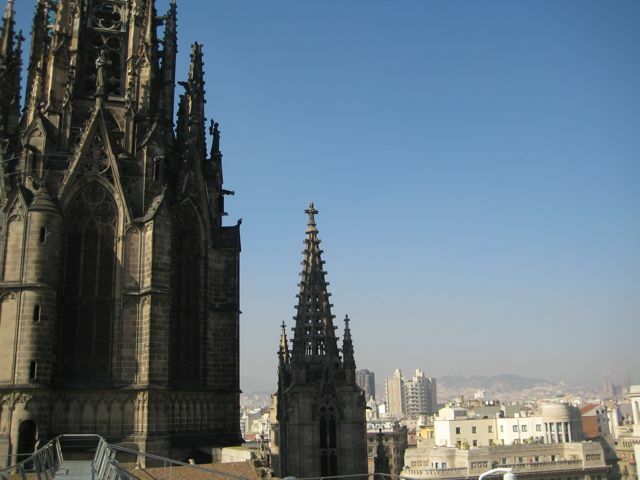 The Barcelona Cathedral, a beautiful gothic cathedral. Unlike the churches we visited in Paris, the Barcelona Cathedral upheld the serenity of a church, despite having its fair share of tourists wandering about. An elevator up to the rooftop provided a remarkable view of the city. 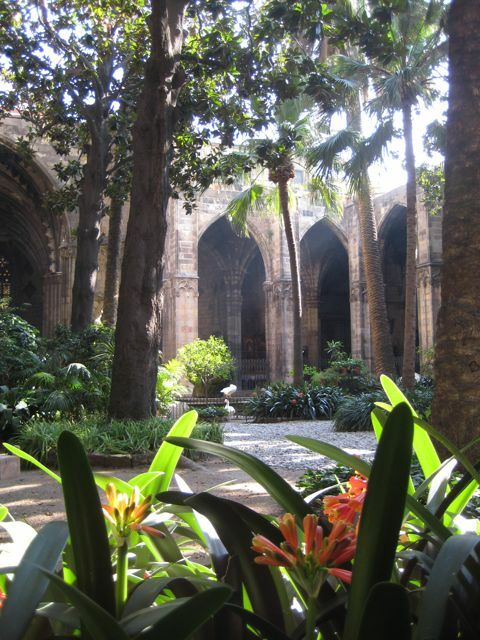 The gardens in the cathedral's courtyard. 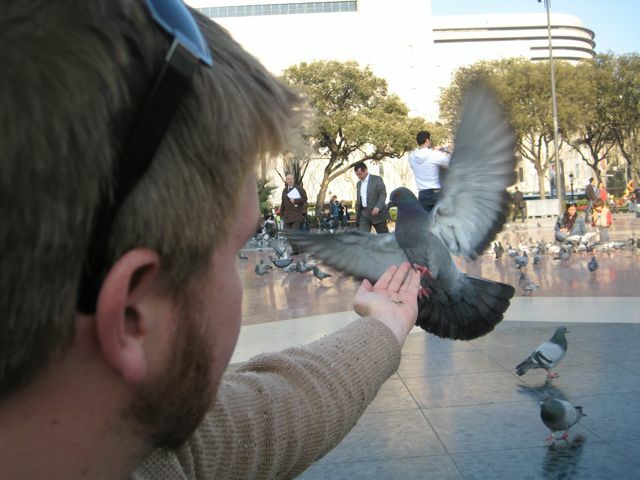 A city square full of pidgeons. After two nights in Barcelona we tempted fate once more and checked in for our flight to Italy with only fifteen minutes to spare. Arriving in Florence, we enjoyed another pain-free EU border-crossing, this time getting through with merely a sniff from a bored-looking Alsatian. We made our way to our hotel, located in the narrow labyrinthian streets of Florence’s historic city centre. From there we explored some market stands and enjoyed another late dinner. Florence was established in 59 BC by Julius Ceasar as a place for his veteran soldiers. Things have moved along considerably since then. Florence is considered as the birthplace of Italian renaissance. Among its famous residents are such luminaries as Galileo, Dante, Amerigo Vespucci, Guccio Gucci and all four ninja turtles. 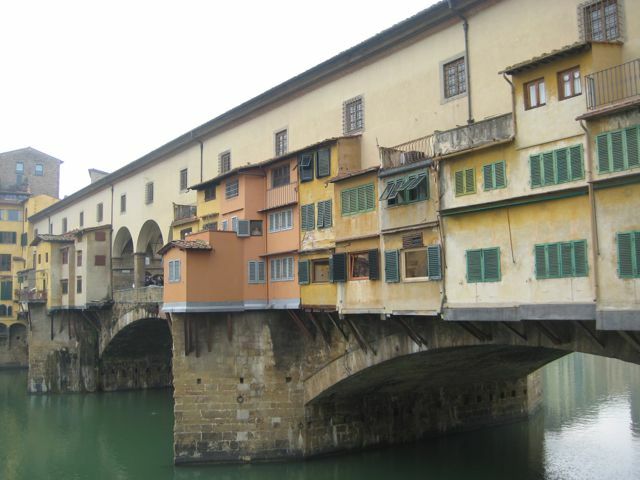 The Ponte Vecchio dating from 1345. Jewellery shops from end to end. We spent the day wandering the ancient narrow streets, bustling city squares, amazing churches and closed museums. The cathedral in Florence was another beautiful and huge structure. Construction began in 1296. Its most impressive feature is the 42 metre octagonal dome roof, quite a feat of engineering for 1420. In the evening we managed to find a small Italian restaurant. Tomorrow we head for Rome, so stay tuned!